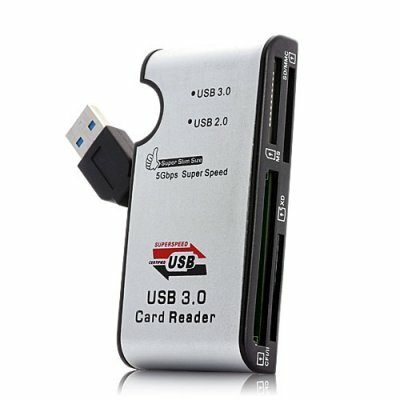 Successfully Added Super Speed USB 3.0 Multi Memory Card Reader (CF, XD, MS, SD, MMC) to your Shopping Cart. Transfer data from/to any memory cards at lightning speed with this Super Speed USB 3.0 Multi Memory Card Reader. Compatible with multiple memory cards including CF, XD, MS, SD/MMC, this handy and useful USB 3.0 Card Reader will help you save previous hours and make both your life and work more convenient and stress free. Why should you waste so much time waiting for your collection of movies, or almost missing the project deadline just because you have to wait 2-3 hours to transfer files from one location to another? Simply insert your usual memory card into the proper slot, plug this great USB 3.0 Card Reader in your laptop or other devices, and start transferring hundreds of Gbs of songs, movies, videos and work files. Just prepare to be awestruck at how fast this little beast can be. An entire DVD can be transferred to your memory card in less than 10 seconds. Or a long version high definition Blue-ray movie in less than a minute. Go get a drink, come back, and everything is done! The world is becoming faster and faster, why not you? Spend less time transferring and enjoy longer entertainment with this awesome Super Speed USB 3.0 Multi Memory Card Reader! Order it right now while supplies last and receive it in a few days! All this is brought to you at a factory direct wholesale price by your best source of top electronics, Chinavasion. Why do I still get USB 2.0 transfer speeds?